Collecting vintage jewellery is more than just filling your jewellery box, it’s fun! Depending on what you want your collection to say about you, you can find estate jewellery for less than $100 to the high thousands to make a statement. Here are some tips on building your collection. One approach is to consider the basic collection, and what you’re missing. Most collectors keep a necklace, a ring (or rings), brooches, and earrings. You most likely have some existing jewellery, but may not have all of these pieces. Start by filling in the blanks before you jump into more elaborate pieces like antique engagement rings. Even though these rings are beautiful, and one-of-a-kind buys, you can spend a lot on something without really understanding what you’re buying. Begin at the beginning, as they say, and build your entire collection one piece at a time. 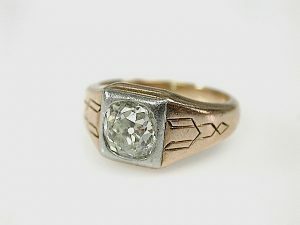 Art deco rings are elegant, but can be fragile if worn every day. If you’re considering everyday use, you may want costume jewellery made to look like the real thing with less expensive materials. This gives you the fashion statement you want, without the expense of wearing and maintaining an antique. Some even buy both at once, using the costume piece to wear while out and about to protect the value of the authentic one. Jewellery dealer Cynthia Findlay Antiques sells both, working with certified gemologists to create handmade pieces inspired by timeless trends of the past. Choose settings, metals, gemstones and model your piece after whatever you like to create a keepsake that will last generations. September 13, 2016 in Jewelry.